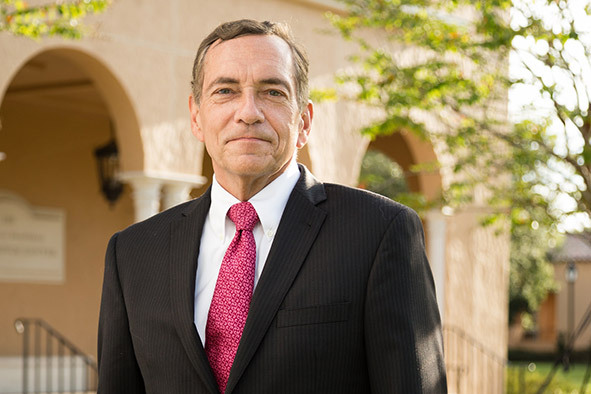 Lewis Duncan served as 14th president of Rollins College from 2004 to 2014. A former dean of the Thayer School of Engineering at Dartmouth College and provost and senior vice president for academic affairs at the University of Tulsa, he holds a doctorate in space physics from Rice University. In addition to his duties as president, Duncan continued to teach and conduct research in space plasma physics and radiophysics. He currently serves as provost—the highest civilian officer—of the U.S. Naval War College, considered to be the preeminent advanced military educational school in the world. Lewis M. Duncan was elected 14th president of Rollins College in 2004. In his 10-year tenure in the presidency, he maintained the College’s status as the top-ranking university in the South, as recognized for nine consecutive years by U.S. News & World Report, and oversaw its rise as a top producer of Fulbright Scholars and U.S. Fulbright Students among master’s institutions in The Chronicle of Higher Education. Overall enrollment in the College’s residential undergraduate program grew, with expanded international student enrollment and new programs. Rollins fundraising also set new records, and the College’s endowment and capital assets rose to $450 million. Milestones of his presidency included the College’s two largest building projects: complete renovation and expansion of the Archibald Granville Bush Science Center and construction of The Alfond Inn, whose net profits are designated for scholarship endowment. Under Duncan’s leadership, Rollins received national recognition for community engagement, including the highest federal recognition for its commitment to community service, and designation as one of 30 schools internationally to be designated an Ashoka U Changemaker Campus for social entrepreneurship. Introduction of the Winter Park Institute and its highly regarded distinguished-speaker series raised the level of intellectual discourse on campus and in the community. Duncan received his bachelor's degree in physics and mathematics and his master's and doctorate in space physics from Rice University. He is internationally recognized as an accomplished research scientist in experimental space physics and radiophysics, and as a leading scholar in study of the societal and ethical implications of emerging technologies. He also remains active in the field of international security studies, participates in national science and technology policy discussions, and is a frequent contributor on issues of higher education strategic change, technology-assisted student-centered learning, and STEM educational reform. Previously, Duncan served as dean and professor of engineering sciences at the Thayer School of Engineering of Dartmouth College. While at Dartmouth, he established the Institute for Security Technology Studies, the Institute for Information Infrastructure Protection, and the MacLean Engineering Sciences Center. He also is a founding director of “Angeli Parvi,” a highly successful early-stage technology venture capital nonprofit corporation supporting faculty and student innovation. Earlier in his career, he held a rising progression of academic and research positions, including appointments as professor of engineering physics, dean of engineering and natural sciences, provost, and acting president of the University of Tulsa; as associate dean for research and professor of physics in the College of Sciences at Clemson University, and founding director of the South Carolina Space Grant Consortium; as a Carnegie Science Fellow at Stanford University’s Center for International Security and Cooperation; as a research scientist and section head in the Division of Earth and Space Sciences at the Los Alamos National Laboratory; and as a National Science Foundation Energy-Related Postdoctoral Fellow. He is a member of Phi Beta Kappa, Sigma Xi, Tau Beta Pi, and Phi Kappa Phi. Among his past honors is the Naval Research Laboratory’s Alan Berman Award. Duncan serves on the Board of Directors of the Center for the Advancement of Science in Space, responsible for management of the U.S. National Laboratory of the International Space Station. He also is an Associated Fellow of the United Nations Institute for Training and Research, supporting the United Nations Operational Satellite Applications Technology (UNOSAT) program. Look back at the accomplishments of Lewis Duncan's decade of service and commitment to Rollins College.